The V-USB USB interface requires more than 1.5kb of flash in its smallest implementation and uses more than 50 bytes of ram, including stack usage. Additional code is required to implement the littlewire interface and to write to the WS2812. The ATtiny10 has 1kb of flash, 32 bytes of SRAM and only 16 instead of 32 registers. So this ended up as a nice exercise in cutting down V-USB to its bare essentials – and further. A main step towards reducing the memory footprint was to switch to an interrupt-free implementation of V-USB, as developed for micronucleus. This allowed to reduce the SRAM footprint by omitting register saving on the stack and avoiding double buffering. In turn, this also allowed reducing the program size. 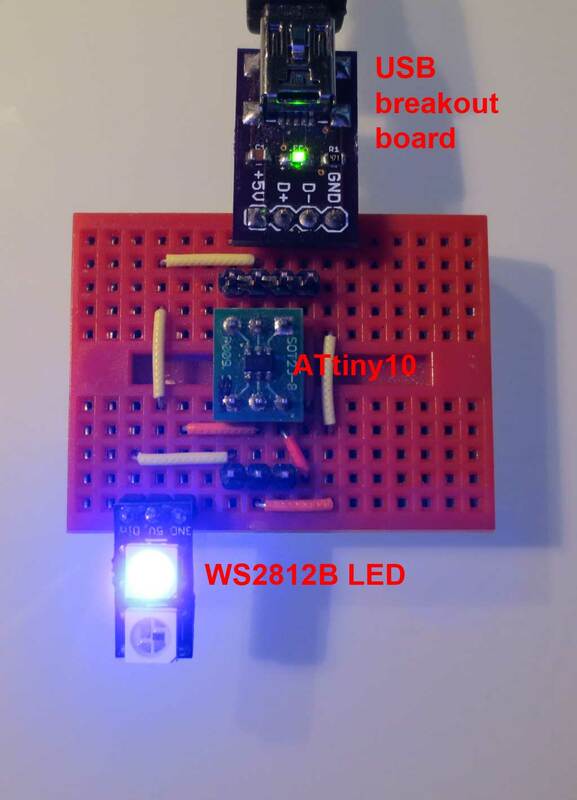 The image below shows a timing diagram of an incoming USB packet, instructing to set the LED color, and the access to the WS2812 LED. The controller “steals” the time to write out to the WS2812 by ignoring the following USB data packet and catching up after the host resends it. This strict in-order processing allows to avoid the need of moving the data around in memory. One major annoyance during this project was AVR-GCC. Even though I used the newest versions of Atmels toolchain (4.8.1), the ATtiny10 support is still quite buggy. The ATtiny 4/5/9/10 come with a “reduced” AVR CPU core. One change is the introduction of different memory access instructions. Instead of 2 word LDS/STS, a 1 word LDS/STS is supported, which allows single cycle access to the SRAM. Unfortunately, AVR-GCC simply does not generate these instructions. Instead, indirect memory access via the Z-Register is used. AVR-GCC effectively wastes 4 bytes for every variable access. I submitted a support ticket to Atmel around 3 months ago, but this seems to be a low priority issue to them. A pity they do not value support of their smallest microcontrollers higher, but maybe people are really only using them for very low complexity tasks. I worked around this issue by using defines (see also this thread). I clocked the controller at 12 MHz using the internal RC oscillator and calibrated from the USB bus timing. The 12 MHz V-USB implementation is much smaller than the recommended 12.8 MHz version, but it does not come with an internal phase locked loop to cope with the more inaccurate RC-oscillator timing. Surprisingly I did not observe any timing errors. Since the reduced core AVR only support 16 registers, I had to manually remap numerous registers in V-USB to avoid collisions with GCC. I removed all handling of the reset signal on the USB-Bus. This means the device will not properly re-enumerate when a bus reset is issued. But this is not a problem if you plug it in after the PC was turned on. V-USB was completely gutted and integrated into the main loop. It only support SETUP requests to a single endpoint now. All additional functions have been removed. This also reduces stack usage as fewer subroutine calls are required. I removed the code to support replies from the SRAM. Data can only be sent from flash. This is possible since only single byte-replies are required to implement the protocol, apart from the fixed USB configuration replies which are stored in the flash. This is most likely the most complex firmware ever loaded into an ATtiny10! You can find all the code in the Github repository. Bonus below, it also works with the new 8mm WS2812 LEDs. Wow, really nice! I was wondering what to do with the attiny10 I ordered! Niftyled looks great, but maybe it is a bit of overkill for a single LED. 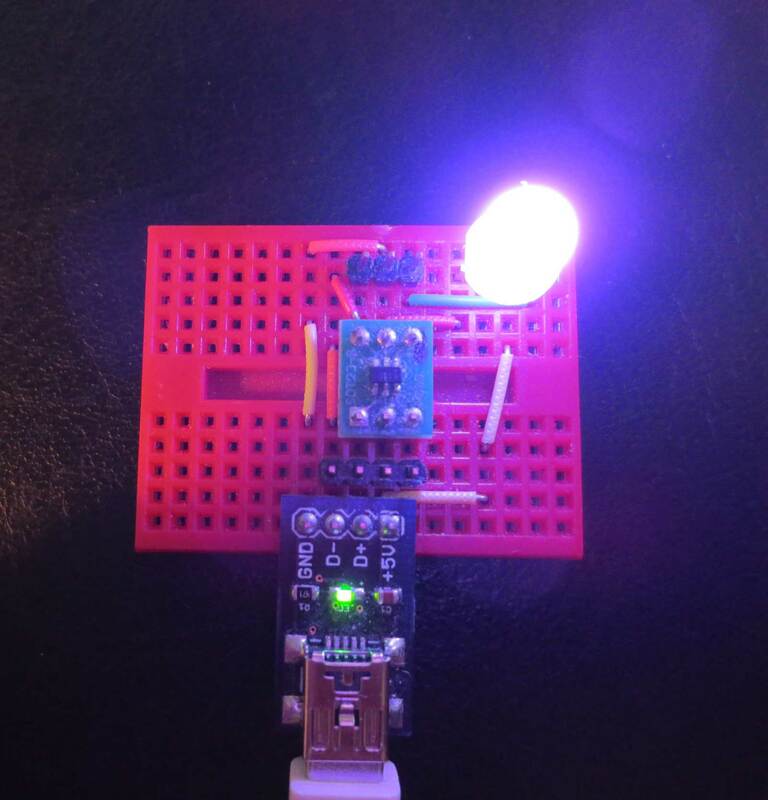 Controlling two LEDs may work but any more than that and I run into trouble with the USB timing. I’m not very familiar with usb, but I have a windows driver that sends an ink reset command to my printer.. except it’s a pain to switch to windows just to do this.. I’m sure others would also love to do a epson reset using linux! The Saleae logic analyzer as able to analyze low speed USB 1.1. That’s what I used. However, your problem rather sounds as if you need some kind of software based USB sniffer on your host computer. I know there are some out there, but I have never used them. I tried to compile with Atmel AVR 8-bit Toolchain 3.5.4 – Linux 64-bit from September 2016 which has gcc 4.9.2 but the final HEX file has 984 bytes instead of 988. I could not find older version on Atmel website with gcc 4.8.1 which you used. When I upload it to attiny10 and connect it to my Linux PC lsusb command shows no new device. Also tried on Windows, no new device was displayed either. I’m not sure if the issue is with my HEX file or something else. Could you please provide the HEX file for testing? Do you have any way of debugging the USB connection, for example with a logic analyzer? It is quite tough to tell what could go wrong. I checked, but unfortunately it seems I do not have a known good hex at this point. Unfortunately I don’t have logic analyzer. I just wanted to try the code on real system, but it is OK. Thanks anyway!